Greenwich Councillors unanimously supported plans to cut spending by £48.6 million last night. Council leader, Chris Roberts, presented the council budget to colleagues at the full council meeting at Woolwich Town Hall. He told councillors that it was "a robust budget" but issued the stark warning that there was a "ticking Tory timebomb" underneath it. The proposed budget would protect the frontline, he said, but acknowledged increased charges for parking and allotments would cause concern for residents. "It is a budget that will come under increasing strain as Tory policies bite hard. When the poor shift out of central London because they can no longer afford their housing costs, they will land in boroughs like Greenwich in need of affordable housing, schools and social care. ", said Cllr Roberts. The speech by the Council Leader drew applause from his Labour colleagues, including the Deputy Mayor, and was labelled "the finest I've heard in this chamber" by Cllr Don Austen. Over £7.5 million will be cut through "management de-layering" and over £3 million has been found in back office savings. A pay freeze for employees will save almost £1.5 million and £2million has been cut from grants to the voluntary sector. The council will "endeavour to keep open" all of its Sure Start centres and protect leisure centres. The council has stated there will be no cuts to the library service - although this claim has raised eyebrows in Kidbrooke. Responding to the Budget on behalf of the Conservative Group, Cllr Spencer Drury praised the "tough decisions taken by the cabinet" and said they "deserve our support in this chamber". Any disagreements they did have would be "quibbling around the edges" of what was a "substantial package of cuts." The council is anticipating that £63 million worth of savings will be required by 2015 as part of their Medium Term Financial Strategy (MTFS) with most of that front-loaded into the next two years. The meeting was notable for the lack of protests that have been witnessed at other council meetings in London and elsewhere. A small group of trade union demonstrators congregated at the entrance to the town hall but their protest remained out in Wellington Street and there was no sign of it in the chamber itself. More objections will be required for future planning applications before they are referred to council planning committees following a decision taken at last night's full council meeting. Currently a planning application that receives two or more objections will be referred to the local Planning Board by council officers, but this threshold is being increased to eight. The cost saving measure is estimated to cut the number of applications considered by committees from 179 to 75 in a year and result in a saving of £27,000 in 2011/2012. Council officers say that at least ten London borough have a higher threshold than that which is being introduced in Greenwich, or they leave referral at the discretion of officers and members. Conservative councillors voted against the plans, with Cllr Alex Wilson suggesting the plans wait til the Government's Localism Bill has been published - expected to make many changes to local planning rules - and Cllr Geoff Brighty questioning whether applications could be dealt with in a timely manner if the number of meetings were being reduced. Deputy Leader of the Council, Cllr Peter Brooks, backed the plan and said that the proposals could be reviewed at the council's AGM in May. 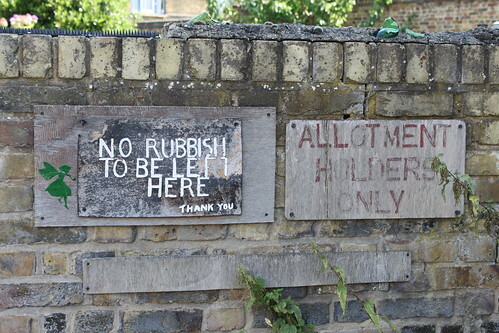 Green fingered allotment holders from around Greenwich are planning to fight against the council's plans to increase their fees. A £21m package of cuts and savings recently unveiled by Greenwich Council includes a steep price hike for gardeners and growers at the borough's 18 allotments - 2 of which are in SE10. Allotments are measured in size using a system called "rods". Prices currently vary between £3.50 and £8.50 per rod but the new costs will be £20 per rod in 2011/12 and £25 per by 2013/14. Allotment holders from outside of the borough will pay double. One allotment owner told Greenwich.co.uk that the net result of the changes is that his allotment will rise from £67 per year to £200. A spokesperson for the allotment holders commented “Allotments foster a sense of community among diverse nationalities and income groups. They should not be priced to appeal only to the rich. They help keep older people healthier and happier - thus probably saving money on the Council's social services budget. The Council is sending out the wrong message”. Representatives from the allotment holders are planning to be a thorn in the council's side over the proposals, and will be attending a meeting at the town hall on Thursday night (20th) to raise their concerns. There's a long waiting list for allotments and the council no longer accepts applications from non-residents because of the strong demand.